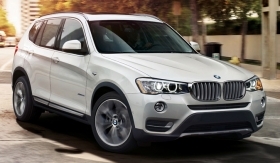 “The xDrive35i (in typical BMW nomenclature) is the top of the heap for the new X3. Using the twin-scroll technology found in the 335i, the 3.0-liter direct-injection powerplant puts out like a fallen debutante. Speaking of falling, the X3 offers hill descent for extremely steep angles where you need to creep the vehicle down. Like any owner will venture off road. Standard xDrive28i X3s get a naturally-aspirated 3.0-liter inline-six (seen in the 328i, among others) that puts out to the tune of 240 horsepower. “For 2015, the big news is the availability of a turbo diesel engine for $1,500 more than the base gasoline-burning turbo 4. I topped off the tank and checked the figures: The average speed for the 442 miles I covered was about 70 miles per hour, and the X3 got 36 m.p.g. -- better even than the federal estimate.